Immunomagnetic separation (IMS) was combined with flow-based chemiluminescence sandwich immunoassays (CL-SIA) for the quantification of Staphylococcal enterotoxin B in milk. Therefore, iron oxide-shell silica-core magnetic nanocomposites were conjugated to biotinylated anti-SEB antibodies (MNC-IgGs). 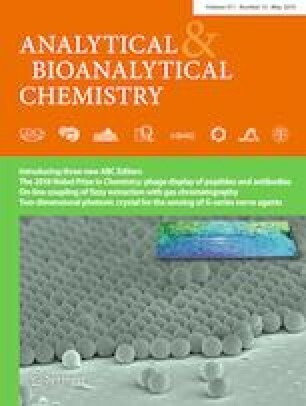 MNC-IgGs were applied successfully for (i) capturing SEB in milk samples by an affinity reaction, (ii) magnetophoretic collection on antibody spots in a channel of a flow-based immunochip, and (iii) sensitive enzymatic chemiluminescence detection of biotin labels by poly(horseradish peroxidase)–streptavidin. IMS was performed in 0.6 mL and 100 mL milk samples resulting in detection limits of 50 ng L−1 and 0.39 ng L−1, respectively, for the combined analytical method. It was shown that the assay sensitivity was dramatically improved by the combination of IMS with flow-based CL-SIA compared to CL-SIA directly applied with milk samples (detection limit 130 ng L−1). The IMS-CL-SIA has a time-to-result of 2–3 h. The reported combined analytical method can be used for a rapid control of SEB in complex food matrices such as milk. In future, even the monitoring of multiple contaminants in food or water may be performed by IMS-CL-SIA. The authors thank Dr. Brigitte Dorner (Robert-Koch Institute, Center of Biological Threats and Special Pathogens, Berlin, Germany) for providing the monoclonal detection antibody mAB S419/5/5 and capturing antibody mAb S1001/4/6. This work was funded by Bundesministerium für Bildung und Forschung (BMBF)–LEVERA (FKZ: 13N12613) and TUM International Graduate School of Science and Engineering (MiCSMaP, No. 9.06).